As the owner of a diesel vehicle, the article on biodiesel and the Vegie powered tractor in ReNew #69, gave me the opportunity to do my bit for the environment. I purchased the book " From the Fryer to the Fuel Tank", by Joshua Ticknell, and read with interest, the pages on biodiesel, and vegetable oil conversions. Having no chemistry knowledge, I consulted safety material at work, and only managed to convince myself, that I didnt wish to mess with these dangerous chemicals. My brother in law John and I decided that the best way to go was to build a separate fuel tank and convert the car to run on Vegetable Oil. Most of you will know that in the engine bay on a front wheel drive car these days there is very little available space to fit anything, but we managed to build a heated 17 litre tank, which we shoe-horned under and alongside the battery, between the battery and engine. This necessitated relocating the vacuum pipe for the brakes and other fittings, but we did it. We sourced a 3 port solenoid valve to allow us to control the fuel source to the engine. 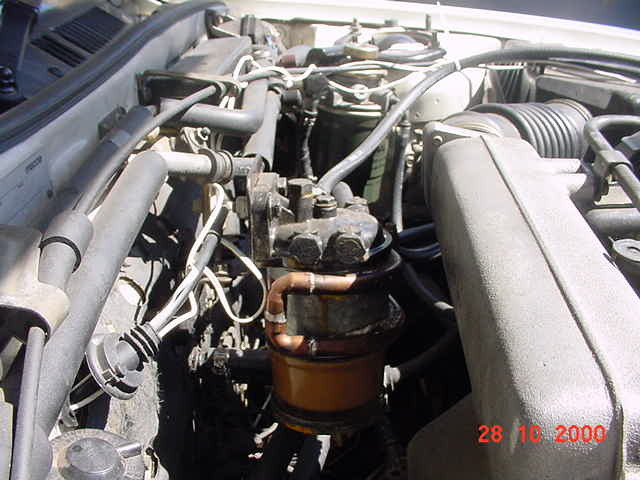 A truck oil filter (CAV type) completed the conversion. Now to find some oil. A local fast food outlet kindly let me have some to try, but before I could fill my tank, I had to get it out of the drum, it was solid. After it sat 2 hours in the sun, I managed to filter the oil into the new tank. I bled the Veg oil fuel system by connecting the outlet pipes from the diesel to the Veg oil, and pumped the diesel until the bubbles stopped in the Veg oil tank. We went for the test drive, when the Veg oil temperature LED came on, we changed over to oil. After about 10 km, we stopped and checked, we hadnt noticed any change in performance or engine beat, and found that the exhaust now smelt remarkably like a barbecue. We were elated. On the drive home, we drove up a hill that we used regularly and found no noticeable difference in performance. Knowing that the oil solidified when cool, we idled the car for 10 minutes, to ensure that there was diesel in the injector pump and lines so that we were sure that the car would start in the morning. The following week, the whole family were going on holidays to Manjimup, about 350km south of Perth. With 40 L of Veg oil in the back, amongst clothing, bedding and holiday items, we were off. 20 minutes into the journey, the veg-oil temperature LED came on and we changed over to veg-oil. As the oil tank has no guage, we stopped at Bunbury and refilled the tank of oil. No problems so far, and about 150 km to go. The weather in Perth had been warm, and as we travelled southeast from Bunbury, it started to cool. After about 100 km, we stopped to check the oil level, and found that half of the tank was still solid. After filling the tank again we placed newspaper around the tank, everywhere that we could jam it in, and be confident that it would stay there. On the way home, we managed to get the oil melted, by prolonged idling, and set off home. After about 100 km, the car suffered a loss of power, affecting the higher speeds and gradually reducing the top speed of the car. By switching from oil to diesel and back again, we were able to continue at legal speeds, although my switch hand had cramp by the time we got home. On the trip , we covered 1700 km, and only used 70 L of diesel. As I have no means of conveniently measuring the oil usage, I calculated back from the diesel usage. I normally get about 14.5 km/L on diesel. The 70 L of diesel I used should have taken me about 1000 km. The other 700 km was on oil. Since then, I have trialled heating the Veg oil filter and fitting a heated fuel line. In my first attempt at heating the fuel line, I used PVC fittings, but soon realised that, although the principle worked, the fittings would let me down soon. These fittings were replaced with brass fittings and now give no leaks. The fuel filter clogging continued to plague me, with longer journeys (higher oil temperatures, for longer) causing filter change intervals to fall to 200 km. I have heard reports that the wax coating of the paper filter element in this type of filter may be a contributing factor to this clogging. I recently cut up a Holden oil pump, to use the oil filter connection, and have fitted this with a glow plug, thermostatically controlled to 60° C. As the filter is mounted with the opening at the bottom, I had expected the need to drill a hole in the top of the filter, to bleed the system, but in practice I have found that the system is virtually self bleeding, with only a few flicks of the oil switch during about 5 minutes running. The injection system seems to be very tolerant of a small amount of air in the fuel. I have located the Veg Oil temperature thermostat (50° C) on the modified housing also. Enquiries of many fast food outlets in my area revealed one using Canola oil. They now supply me with 40 L per week of relatively clean oil, which is liquid at room temperatures. Since changing the Oil filter type, adding the glow plug and using Canola, I have eliminated the delay before changing to oil. Immediately after starting, I change over to oil and there are no obvious negative effects. I have travelled 1000 km since filling the diesel tank and my diesel fuel gauge has just dropped below the Full mark. The oil filter is still the one I installed at the time I changed to Canola oil, so it seems that the combination of changing the filter type and changing to Canola oil has, at least, reduced the filter clogging problems. I have since learned that the galvanised sheet metal, which we used to construct the tank, reacts with the vegetable oil resulting in globules, which clog the filter, being formed. Since I have emptied the tank, washed it out with acid to remove the zinc and rinsed to remove the acid, the problem has been eliminated. DO NOT MAKE FUEL TANKS FROM GALVANISED STEEL! Since our first test run on oil, the car has done about 12 000 km, with the only problems being due to allowing oil to cool in the injector pump. 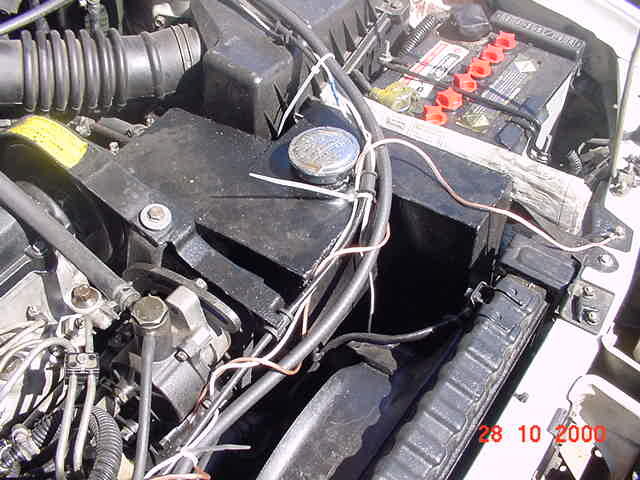 (Recovering from this requires the kettle to be boiled and the hot water poured over the injectors, plumbing and pump several times) To overcome the problem, I modified a "Jaycar Turbo Timer" to give me a range of 5  10 minutes runon, after turning off the oil. An override switch allows the motor to be stopped for short periods, without changing back to diesel. Using glow plugs, the engine starts well on the hot oil. If the weather is cool I change back to diesel if I am turning off for more than an hour (longer in hot conditions). To reduce the waste of diesel idling with the run-on timer, I usually turn back to diesel about 5 minutes from home. I now use biodiesel instead of diesel to start & shutdown. A concern I have with using Canola oil, is that I have been advised that a build up of carbon at the top of the piston will occur, resulting in increased engine wear. A future project is to install some form of water injection (as used in large marine diesel engines, fuelled by bunker oil) to combat the carbon build up. A plumbing diagram, and schematics of my electrical wiring are attached. 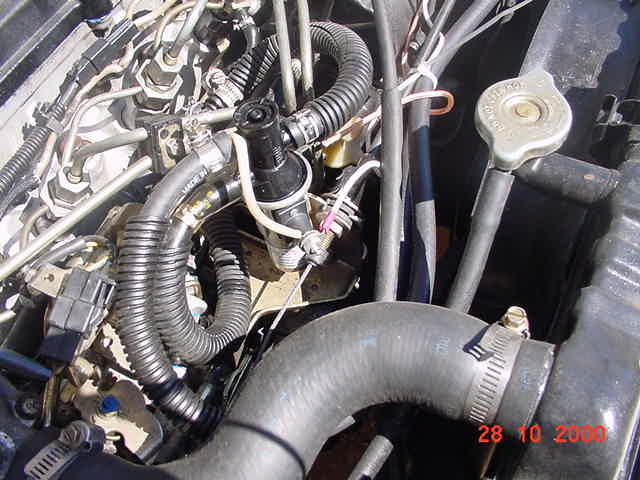 A further improvement will be to replace the 3 port solenoid valve, with a 6 port unit, to allow the fuel return line to be directed to the fuel tank in use, instead of being connected to the injector pump suction line. This will enable shorter shutdown times, as there will be little mixing of the return line fuel with the fuel from the tank in use, allowing more reliable operation and reduced biodiesel consumption. At present, the return line fuel is gradually diluted with biodiesel, as the run on time proceeds, hopefully being >90% biodiesel at the end of the run on time. This will ensure that the fuel is 100% biodiesel at the end of a short (~1 minute) run on time.